The letter we are working on at home this week is "P". We start out on Monday doing handwriting and talking about things that start with the letter "P". So I ask the kids for some things that start with "
P" and Kaidi says, "Pituitary Gland!" (with a slight snicker afterwards bc it's such a fun word to say). First of all I am shocked that THAT was the word she chose instead of something a lil simpler like "pop" or "pig". We go through talking about all sorts of other words.. "pretty" "pizza" "popcorn" "pen".... you get the idea.. As the kids get into the handwriting exercises, I like to sit and just watch them... Asher struggling to stop the line from going further up the page (he writes his letters from the bottom to the top instead of top to bottom) then he sits and stares a minute, trying to decide where to start his pencil again... Kaidi breezes through this part of the activity, she's been writing letters for a while now... as we are sitting there, Atlas is ,of course, all over the place.. climbing on the table, grabbing crayons and aggravating Asher as much as possible.. Kaidi says, "Mama, you know what else starts with the letter "P"!" I look at her, while trying to drag Atlas off the table, "What's that, Baby?".... she looks up at me with a big grin on her face and says so sweetly, "Prayers!" Now I am going to take you back a few days... share a wonderful story about child-like faith... Kaidi is not one to have accidents through the night, but this past week she wet the bed 4 times over a weeks time. Saturday morning while stripping the bedding.. again... I was talking to her and telling her that I may call the dr. Monday morning because it was not normal for her to be wetting the bed so many times lately when she didn't usually have accidents. She's real big in to praying for things every night and I am so thankful that she is open to us about what she prays for. Toyia's daughter, Sophie, recently had an accident and hurt her leg very bad, Kaidi prayed for her a few times that week, That night she told Greg that she prayed that everyone's boo-boo's would get better, and she also prayed that she wouldn't wet the bed that night. She woke up that morning dry and the first thing she shared was that she didn't wet the bed! God had answered her prayers.. He answered them again Sunday night. I love that something so minor and honestly, something I wouldn't have really thought about praying for, God answered, she realized that and from that, her faith grew and she asked again the next night, knowing that her God could do anything... children can teach us so much about faith. Back to our "school time". We finished up our handwriting sheet on "P" and Kaidi did a worksheet where she had to cut out little Party hats that had different letters on them and then paste the ones that had a "P" on them on the kids on the worksheet. After she was finished, we went outside to check out the motorcycle ride-on toy that Pop and Nana brought back from Uncle Adam and Aunt Heather's house. They really enjoyed it but it was very cold out so we weren't able to stay out for very long. That afternoon we decided to ride over and enjoy a little Picnic at the Park. Thursday morning, Atlas and Kaidi had dentist appointments. We took all 3 of them in hopes that if there was enough time, they may could look over Asher's teeth, too. Atlas is in need of some dental work. He's had a tough time with his teeth. 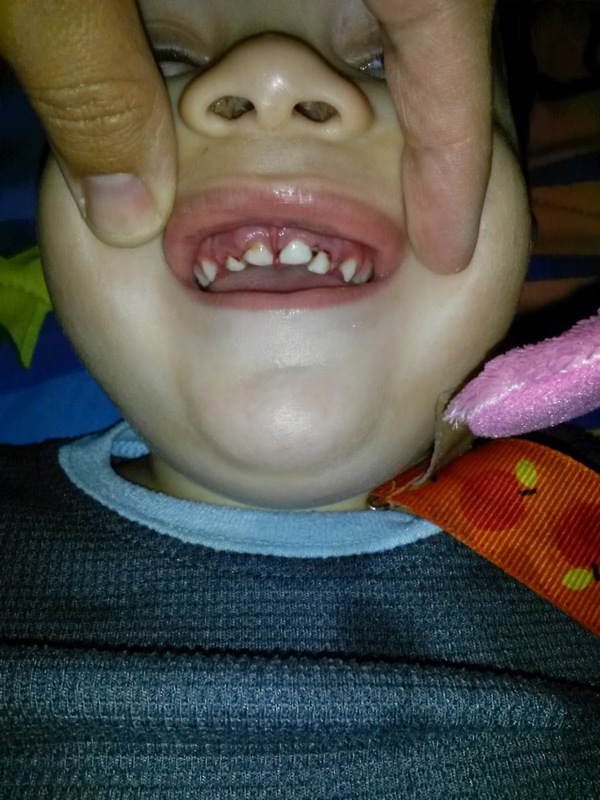 After falling and knocking the 4 top teeth up in his gums this past summer, they have seemed to just deteriorate from there. He wouldn't cooperate at all. 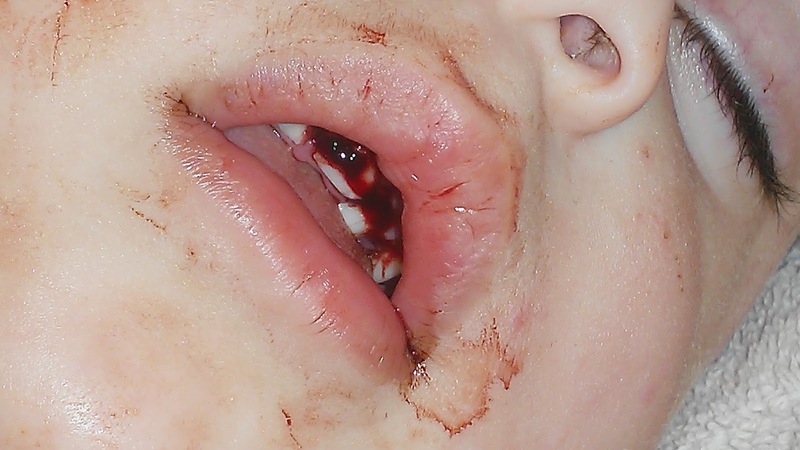 (probably didn't help that he had a tonsillectomy 2 weeks prior) Kaidi did a very good job. She was nervous at first and had a few tears, but she calmed down quickly and was a wonderful patient. 2014 was a very.... adventurous year for us. We started out 2014 with a birthday for Gregg in which I surprised him! We took a trip to New Orleans, LA to watch Alabama play in the Sugar Bowl. I have never been that far west before so it was exciting for me. :) Never imagined I'd take the road trip of a lifetime in the same year. The end of January we got a little bit of snow, just enough to sprinkle the ground a little bit, but I called my mom and Opp got a pretty good layer of it so we set out to make the hour drive (that ended up being 2 hours after closed roads in to cities and taking detours on icy county roads). It was well worth the drive after the fun our kids had. Gregg took Kaidi out on a date for Valentine's day. She asked me to roll her hair and put makeup on her and she made a sweet little card for him. He picked her up, bringing flowers and a heart box of chocolate and they went out to dinner to Chili's. She thoroughly enjoyed it and still talks about her date with her daddy. We took the kids to Landmark Park for their 2014 Spring Farm Day. We really enjoyed this family day and ended up becoming members of Landmark Park. The end of April, the kids enjoyed a wonderful day of MUD.. I love letting my kids be kids.. and get nasty and have a great time doing it.. it's nothing a little soap and water can't take care of.. In May, Gregg and I went to a Kirk Cameron marriage conference in Fairhope and had a great weekend getaway and a refresher for our marriage. We had found out earlier in the week that Gregg's position with the bank was being eliminated and he had 60 days left with his job. This was very stressful for us but we were positive and knew that things were going to be ok.
We survived another birthday of the twins without them. They would have been 7. We took a trip to the beach for Mother's Day and had a wonderful time with the kids. It's my absolute favorite place to be. We went and visited my brother and his family for memorial weekend and enjoyed spending time with them and also were able to take the kids to a hot air balloon festival. It was a great family day. 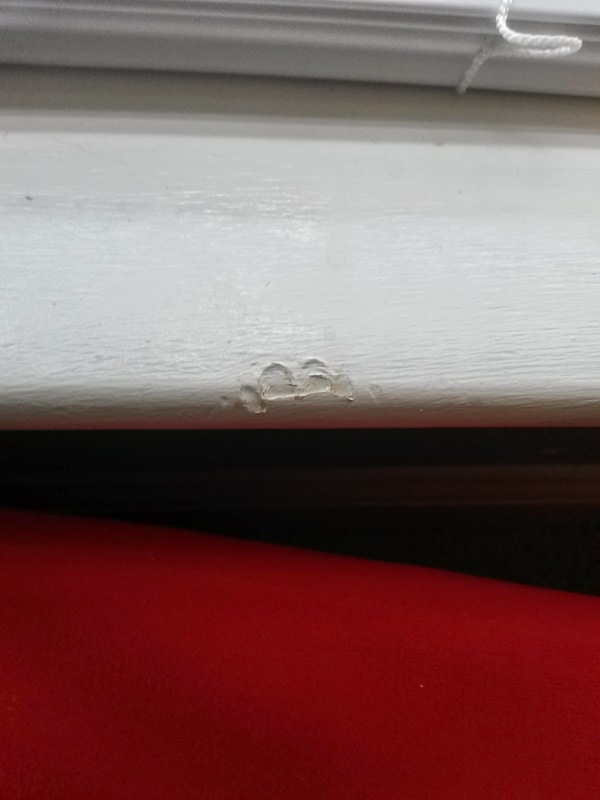 a little later in June, Atlas's teeth met the window sill and there was blood everywhere and he was crying, I was crying, Kaidi was crying... it was rough stuff.. 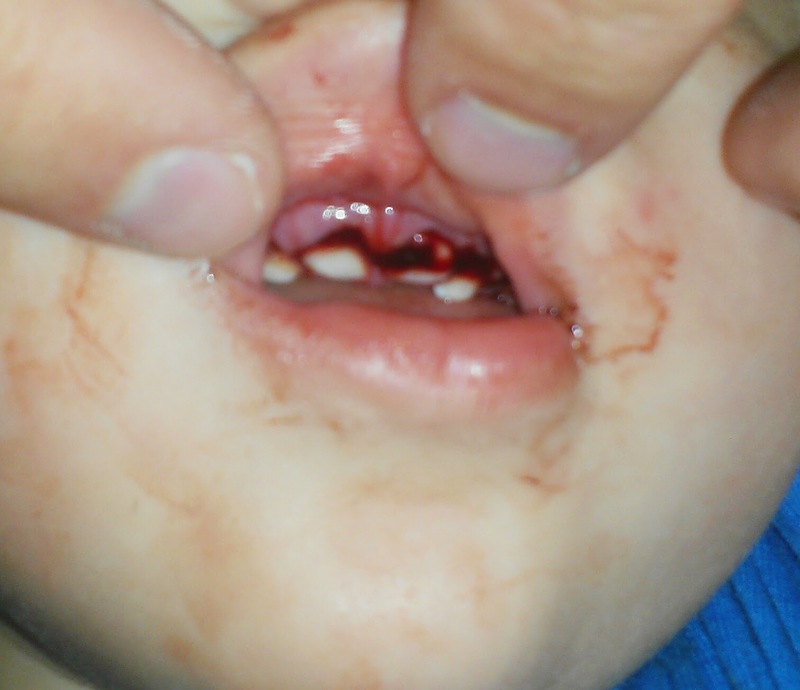 I couldn't get a hold of Gregg or my mom... and I am typically a pretty calm person in these type situations... Not so much on this day..
this happened 2 days before he turned 2. :( His teeth are still up in his gums. I'm hoping they will be ok once he loses them and his permanent teeth come in. Those middle two are pretty damaged and nasty looking now. So he turned 2 and we had a little party at my mom and dad's house. It was very low key and enjoyable. Kids got into a food fight and it was fun watching them. We decided to take the kids on a canoe trip (daring, I know) but we had a WONDERFUL time and the kids did so good. That last week of June, Gregg and I had kinda talked about just moving off.. heading to Colorado or Montana. Only thing is, how would we know if we even liked it out there.. we decided to take a road trip. This was the best opportunity for us. I didn't work, Gregg's job was ending and he had a severance pay, our kids weren't in school.. why not? So we woke up July 1, packed a suitcase or 2, filled up a tote, loaded the car up and headed North. This was the trip of a lifetime. An adventure for our family and we made so many memories.. I am so thankful for this trip and seeing all that we saw. Covering 19 states in 20 days, traveling a total of 7,800 miles. Seeing family and even friends on the other side of the country. It was amazing. I can't even begin to share pics from the trip. We celebrated our 8th anniversary on the road and Asher did turn the big 3 while we were on the trip and we were able to celebrate at a Chuck E. Cheese in California with Gregg's youngest brother and his family. We got home from our trip (after driving 31 hours straight) on a Sunday and I had to get things ready for our annual B&K Remembered Blood Drive the following Friday. We had a wonderful turnout this year and I am so thankful for all the lives saved through our drive. We enjoyed another trip to the beach for labor day and in October I enjoyed taking the kids to the lake for the Scarecrows in the Park that the trailmasters do every year. The zombie run the next weekend was a lot of fun! We were in a team of 5 and all started out with a certain number of flags.. as long as one member still had a flag, as a team, we survived.. I had all of my flags through the entire run and lost all of them in the last 20 seconds.. I was SO mad about that, lol but it was still a lot of fun. Halloween was the next week so my kids got to enjoy a fall festival at my parent's church and then Halloween later in the week. Kaidi wanted to be Dorothy and Asher wanted to be Batman, but we couldn't find one in time, so he was completely cool being a Ninja Turtle and Atlas was an army man. They were too cute and we had a good time taking them around to a few houses before settling in at home. In November, I took Kaidi to her first ever fair. It was a good Mommy/Daughter day and she really enjoyed seeing the animals and riding the kiddie roller coaster. December 1.. Kaidi turned 5... the night before we enjoyed making cupcakes and she thought it was really cool that i made one special for her. Her party was the following weekend.. I was so excited for her birthday.. We only let her invite 5 friends and we had it at my mom's church. It was a paint party and the kids enjoyed painting different things and then came the moment her daddy and I had been waiting for for months! We bought her a horse.. I think the end of September? and decided to wait until her bday for her to know it was hers. She had been riding Mikey, but never knew it was hers.. She loved him more than anything and we couldn't have picked a better horse for her. 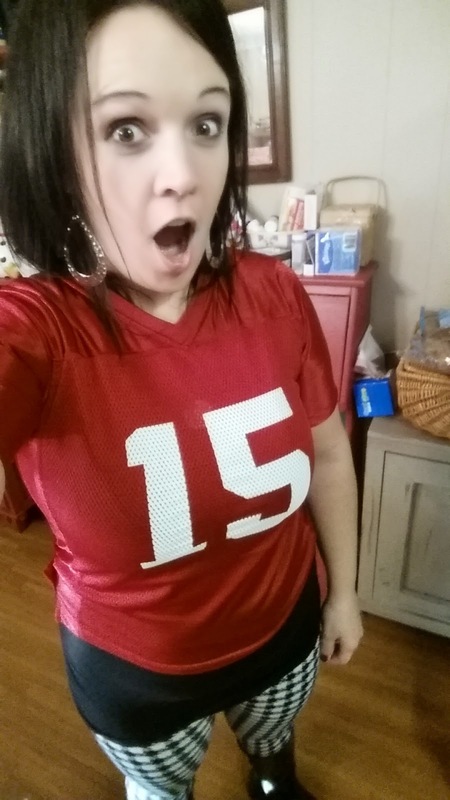 The next week, we left for Pigeon Forge to celebrate Christmas with my family. My parents decided to get a cabin and take us all to the Dixie Stampede for our Christmas this year. We left early Thursday morning and got to the cabin late that afternoon. It had a beautiful view... we enjoyed the pool table and the air hockey table and decided that we were going to go see Cades Cove the next morning.. well we woke up , started down the drive way.. got on the main road and my van started shaking like crazy.. We had NO clue what was going on.. there were a few things that we thought might be wrong, but here we were away from home and all the tools and stuff the guys needed.. we ended up taking the van back to the cabin and moving the carseats over to my brother in law's truck and driving it. It really messed things up for us because we were supposed to be leaving first thing in the morning heading back home a day early to make it to Gregg's moms 50th birthday party. We went to the Dixie Stampede that night and the kids LOVED it.. especially Kaidi! She would barely even eat her food for fear of missing something!! We weren't planning to be their an extra night so we really didn't know what to do that evening.. Our bunch went in to Gatlinburg and walked up and down the streets looking for a particular shop.. no luck, but we decided to have Kaidi's ears pierced again.. she was excited and nervous all at the same time.. When we got back to the cabin that night, we decided to let the kids decorate little Christmas trees. They had a wonderful time with that. That next weekend, I took the kids over to Andalusia to see Santa Claus on the square. It was so cute how they had the square decorated with all the little cottages, each themed differently..
We had Christmas at my grandparents on Christmas Eve at lunch and then had Christmas with Gregg's family that night. The kids got lots of great things and it was hard to settle them down that night to get ready for Santa Claus to come! Christmas wore the boys out!! Pretty much wraps up 2014... It was a wonderful, adventurous year for us. I am looking forward to all that 2015 has in store for us! Looking through all these pictures I have realized just how many there were of Atlas sick since we've been back.. :( Poor fella.. ear infections.. strep... bronchitis.. rsv.. hmv... just back to back sickness..
And since this picture, he has had strep again and after seeing the ENT this past Friday, his Tonsils are coming out this Thursday! His surgery will take place in Dothan and they will keep him overnight because of his age. Prayers appreciated! Hoping he recovers as well as Asher did when he had his removed in December 2013.